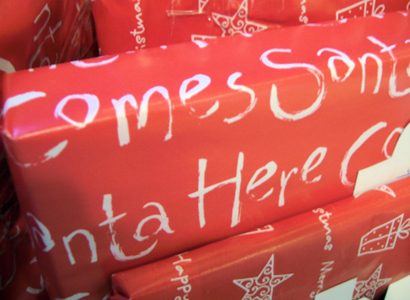 The Guardian Developer Blog has posted December’s “Carnival of journalism” round-up, after asking “what journalists and programmers might exchange as presents during the festive season”. It’s well worth a read to find out the wish lists of some key people interested in the space where journalism and technology meet. Journalism lecturer Paul Bradshaw’s “fantasy” Christmas list includes wishing for the ability to cross link in ways to make journalism more transparent. Add contextual information on any individual mentioned in a story, for example a politician who receives payment from a particular industry. This entry was posted in Editors' pick, Online Journalism and tagged guardian developer blog, Paul Bradshaw, wannabe hacks on December 15, 2011 by Sarah Marshall. Wannabe Hacks, a blog started less than a year ago by five young hopefuls starting out in careers in journalism, is looking for new quintet of aspiring journalists. Applications open for the second generation on Wannabe Hacks on Monday 1 August when the current Hacks – the Intern, the Student, the Freelancer, the Maverick and the Chancer – will hand over the reins and take a more hands off approach to the site. Last autumn, when five journalist hopefuls were starting out on their different paths but all with their eyes on one career, the group began to blog about their experiences. After an early mention in the Media Guardian and a savvy use of social media, the blog became a source of information and inspiration for other trainee journalists. Ben Whitelaw is the Student. Whitelaw spent the past year studying for an MA in newspaper journalism at City University London and now has a job at the Guardian. He is content co-ordinator at the Guardian Professional Networks, a selection of B2B websites about public services. Matthew Caines is the Freelancer. He is a freelance journalist with the Guardian (housing and society) but also writes for various lifestyle and fashion e-mags. Nick Petrie is the Intern. He is now working for the Telegraph as a community manager. Tom Clarke is the Chancer. He also spent the last year studying for an MA in newspaper journalism at City University. Alice Vincent is the Maverick. She spent three months in New York, as an intern at NYLON magazine and is now working at Wired magazine in London. 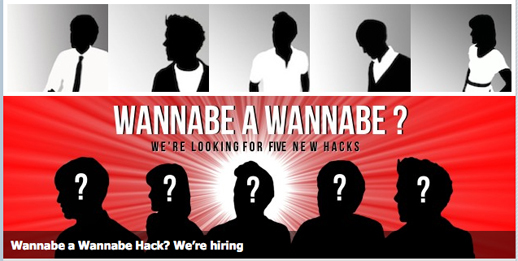 Writing on Wannabe Hacks today, the five say the application process will be open for two weeks from Monday (1 August). There are full details of who should think about applying on the site. This entry was posted in Jobs, Social media and blogging and tagged internships, student journalism, wannabe hacks on July 25, 2011 by Sarah Marshall. There’s also a psychological toll which I think as an industry we’re becoming increasingly aware of which is the tendency to suffer from depression as a result of traumatic experiences that you’ll inevitability accumulate along the way. So we have had cases of post-traumatic distress disorder diagnosed in several of our reporters and it’s deeply distressing to witness. It takes a lot of treatment and a long time to recover from, although I’m pleased to say that in all cases, we’ve seen a full recovery and people have gone back to work and come to terms with what they’ve experienced in the past. But it’s not easy and it’s not good going into being a foreign correspondent thinking it’s all travel and meeting people and being on the frontline of a war because there’s a heavy price to pay. This entry was posted in Editors' pick, Jobs, Training and tagged careers, foreign correspondent, Jobs, Sean Ryan, wannabe hacks, war reporting on June 2, 2011 by Rachel Bartlett. Work experience has caused a bit of a stir in the nationals recently, what with Clegg and Cameron slugging out over social mobility. In an industry like the media, controversy over its almost mandatory unpaid placements is never far away. But bloggers Wannabe Hacks have taken a step back from the debates about how to solve a problem like work experience to ask: What are the 50 best journalism placements? The Wannabe Hacks – who have “all done reams of work experience themselves” – will be asking aspiring journalists to nominate their best placement in no more than 40 words. They can be paid or unpaid, and contributors are asked to include the publication name and section if applicable. Nominations can be sent to Ben Whitelaw on top50@wannbehacks.co.uk. The deadline is Friday, 27 May at 5pm. This entry was posted in Awards, Editors' pick, Training and tagged placements, Training, wannabe hacks, work experience on May 3, 2011 by Joel Gunter. Kelvin MacKenzie’s rubbishing of journalism courses has sparked a heated debate across numerous websites. “There’s nothing you can learn in three years studying media at university that you can’t learn in just one month on a local paper,” he wrote in today’s Independent, saying he would shut down the colleges. This post on Wannabe Hacks gives four reasons why MacKenzie is wrong and makes this interesting observation of why the former Sun editor – who has only one O-level – ended up in journalism. This is key for me: the fact Mr MacKenzie had no choice but to scrap at a local paper when he was 16. He had few prospects and no options beyond an early entrance to the newsroom. But when you have the chance to go to uni or do a postgrad course, I think it’s natural to want to do so and to push yourself academically. It’s not for everyone and the jury’s out as to whether courses do you good. But let’s not take advice from a man who didn’t have a choice. Over on Jon Slattery’s blog, he points out it is not the correct climate for newspapers to take on trainees. The trouble with the local press route into journalism is how are regional newspapers going to take on trainees when they are cutting staff? Look at today’s news. Midland News Association, publisher of Britain’s biggest selling regional, the Wolverhampton-based Express & Star, is planning 90  redundancies. The National Council for the Training of Journalists agrees. HoldtheFrontPage has this interview with the chief executive of the NCTJ, Joanne Butcher. She said: “Kelvin MacKenzie, of course, exaggerates to make some valid points about media degree courses and the value of learning the journalist’s craft by cutting your teeth on a local paper. “But he does seem stuck in a time warp. Unlike when Kelvin trained on the South East London Mercury and was sent away to college, newspapers simply don’t take on many raw recruits these days. In this post, a journalism student from University of Central Lancashire, Wordsmith, also argues the difficulties in being accepted on a paper directly from school. On papers you don’t have time to fail, because of the pressure on you and the hundreds of people waiting to take your job. A blog post on Rantings of a Sub Editor suggests a non-journalism degree first does help and some training, in a sub’s case the “basics of libel, copyright and privacy law, which are essential, a grounding in public affairs – local and national – and a working knowledge of Quark” and Substuff has some pretty good advice for wannabe journalists too. Roy Greenslade also believes it is important to get a university education before going on to take a postgraduate journalism training course and, in this blog post, responds to MacKenzie’s jab at Greenslade’s City University lectureship. I came up by the same route as Kelvin. He is right about it having been a terrific combination of learning-on-the-job and fun. But that was then, and this is now. A university education is far better for journalists – and for journalism. It sharpens their critical faculties. It provides a great grounding in the basic skills. It is so good that many graduates are able to step straight into national papers. Over on the Press Gazette blog, Dominic Ponsford argues MacKenzie “has a point about the ballooning cost of journalism training”. MacKenzie does highlight a looming problem for the journalism industry, and one which it desperately needs to address. On the whole journalists are nowadays expected to fund their own training (the industry used to provide it on the job via block-release schemes). With first degrees costing up to £9,000 a year, and post-grads another £10,000 on top, and with food and board added in, you are looking at spending £50,000 to to bag a job which, in the regional press, offers starting pay of £15,000. How many aspiring journalists are realistically going to do that? Journalism.co.uk’s earlier comment post – where you can tell us why you think MacKenzie is right, or wrong. This entry was posted in Comment, Editors' pick, Journalism, Training and tagged holdthefrontpage, Jon Slattery, Kelvin MacKenzie, Press Gazette, rantings of a sub editor, Roy Greenslade, wannabe hacks, wordsmith on April 8, 2011 by Sarah Marshall.